Deep sea foam-blue color. Great dispersion and brilliancy. 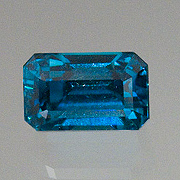 Measurements:	9.76 x 6.25 x 6.62 mm.